Click here for links below to some practice materials for the CAT in Mathematics. Here you can find information on all of CUNY’s placement tests. algebra, college algebra, and trigonometry. Numerical skills / pre-algebra questions range from basic math concepts and skills (integers, fractions, and decimals) to the knowledge and skills that are required in an entry-level algebra course (absolute values, percentages, and exponents). The algebra items are questions from elementary and intermediate algebra (equations, polynomials, formula manipulations, and algebraic expressions). The college algebra section includes questions that measure skills required to perform operations with functions, exponents, matrices, and factorials. The trigonometry section addresses topics such as trigonometric functions and identities, right-triangle trigonometry, and graphs of trigonometric functions. No two tests are the same; questions are assigned randomly from the four sections, adapting to your test-taking experience. Placement into CUNY’s required basic math courses is based on results of the numerical skills/pre-algebra and algebra sections. The test covers progressively advanced topics with placement into more advanced mathematics or mathematics-related courses based on results of the last three sections of the test. Students are permitted to use only the Microsoft Windows calculator while taking the test. Below are some sample tests and websites containing more samples and information about the CAT in Mathematics and related materials. Special software may be needed to view some of these files; check under our Software section to get them. 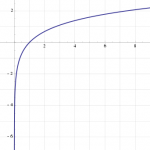 The natural logarithm is the inverse of the exponential function.